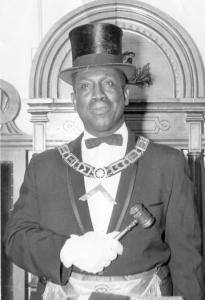 William “Bucko’’ Bennett dressed in Masonic regalia. In 2007, William “Bucko’’ Bennett was among a cadre of then unsung airmen called to Washington, where President George W. Bush was on hand as they received the Congressional Gold Medal, one of the nation’s highest civilian honors. Yet throughout his adult life, Mr. Bennett spoke little of his days as a vaunted Tuskegee Airman. Even when he did, he shrugged it off as simply having done his duty. Mr. Bennett, a retired marine engineering technician at the Boston Navy Shipyard in Charlestown, died of heart disease Jan. 19 at Stonehedge Rehabilitation & Skilled Care Center in West Roxbury. He was 89. “I don’t think he saw what he did as a Tuskegee Airman as being all that special,’’ said Laura J. Brown of Lynn, Mr. Bennett’s niece. “I think he saw it as his duty as an American. It’s well documented that the Tuskegee Airmen, who helped maintain planes and provided bomber escorts during World War II, were discriminated against at home and abroad. Yet Mr. Bennett did not dwell on that, friends and family say. McPherson met Mr. Bennett in 1996, when he joined Mount Zion Lodge No. 15, part of the Prince Hall Grand Lodge of Massachusetts Free and Accepted Masons. Both men are past lodge masters. McPherson said that several years ago when he and Mr. Bennett attended a Shriners’ conference in Charlotte, N.C., he asked his waitress whether she had heard of the Tuskegee Airmen. When the young lady realized she had been serving a Tuskegee Airman she told her co-workers, who rushed to meet Mr. Bennett. Harvey F. Sanford of Roxbury, a former Tuskegee Airman, remembers Mr. Bennett from their days before the war. Sanford said that he and Mr. Bennett kept in touch over the years, but by the time he learned about his friend’s death, his services had been held. Before becoming a Tuskegee Airman, Mr. Bennett was a typical guy, his niece said. “In his early years, my uncle liked to drive fast cars, hang out with the guys, and he was a standout football player in high school and also in the Air Force,’’ Brown said. “He often said that his early experiences in football helped shape his life. The son of immigrants from Barbados, Mr. Bennett graduated from Mechanic Arts High School, now John D. O’Bryant School of Mathematics and Science, in 1940. After graduation, he worked as a marine engineering technician for the Boston Navy Shipyard until he was drafted and sent to Tuskegee, Ala., where the unit was trained. Mr. Bennett was married to the former Frances L. Ross for 47 years until she died in 2000. The couple had no children. “I’m pretty sure he was devastated, but he was a strong guy and not one to give up or show weakness,’’ Brown said. “I think at first after she died, he spent a lot more time with the fellas, and he became more involved with contributing to charitable organizations. He and his wife were devoted churchgoers, though they didn’t attend the same church. I’m sure he got support from his church family at St. Augustine & St. Martin’’ in Roxbury. McPherson said he considered the Bennetts second parents. Mr. Bennett leaves a brother, Merton D. of Roxbury, and a sister, Gloria Scales of Roslindale.